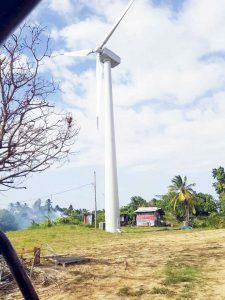 Almost three years after purchasing a wind turbine and bringing it into the country, a Berbice hotel is moving to dismantle the turbine it had erected. The turbine is supposed to help the energy costs of the hotel by connecting to the Berbice/Demerara grid and offsetting with power from the Guyana Power and Light Inc. However, more than 18 months after the turbine was erected at Skeldon, there is little response from the authorities. An official of the Classic International Hotel, Corriverton, disclosed that there have been several meetings with the authorities, including with the Guyana Power and Light Inc. The frustration of the company would come as the Coalition Government continues to push for a ‘Green Guyana’, targeting renewable and other forms of sustainable energy. GPL has said it is looking to partner with independent power producers. However, that has not been doing so well. GPL, grappling with technical and other issues, is facing problems of how to take the power from the producers. In fact, the current system in Demerara, it has been reported, has limitations to what can be safely added to the grid. A planned wind farm to be placed at Hope Beach, East Coast Demerara, had to reduce the amount of megawatts it had envisaged because of the limitations. With regards to wind turbine in Berbice, the hotel spokesman explained that the turbine was brought into the country to help bring down the operating costs of power for the Corriverton hotel, which was opened in April 2017. In March, Government defended the delay. According to Minister of Public Infrastructure, David Patterson, the matter is more than what meets the eye. Patterson said he had met with the principal of the hotel in the past concerning this matter. In April 2017, the Ministry and its energy-related agencies were “surprised” to read reports in the media of the launch of Mr. Narine’s hotel and wind turbine. However, it was also pointed out that the law only restricts persons from supplying power to another, except in cases where a licence is granted by the Minister. The Ministry had said that GPL’s existing frameworks cover the connection to its grid of either independent power producers (IPPs) supplying 10 MW and more or businesses supplying 1.5 MW and above. Patterson had said that the hotel officials were advised that it was not possible at this time for an individual to connect to the grid unless the supply met the minimum of 1.5 MW. However, the Minister had said, despite this, it was agreed to examine Narine’s proposal with GPL with the objective of identifying and addressing the technical issues while the framework for intermittent power supply below 1.5 MW to the grid was being developed. The Minister said that in early February, he met with Narine on the subject and agreed to discuss with GPL the possibility of accommodating the request, even on the basis of a pilot project. Patterson had also noted that while the public may be anxious to seize the opportunity of solar and wind energy and to connect to the grid to save on the cost of energy storage, the complexity of utility size generation, transmission, and distribution of power – a complexity which is further compounded by the weaknesses of GPL’s grid and the sensitivity of intermittent supply – requires judicious adherence to feasibility studies and grid interconnection processes, which are typically detailed and costly, but which are necessary to ensure reliable and stable supply of electricity and the safety of the grid. Minister Patterson was not immediately available for a comment yesterday.